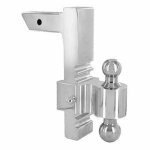 Andersen Manufacturing Aluminum Hitch Products at Carolina Classic Trucks, Inc. Rapid Hitch aluminum adjustable ball mount continues as one of our products that every one �just has to have� - not only because it is so easy to use, but also because it looks great. Available in various configurations there is a Rapid Hitch that will work for you. The Alumistinger is unique and stands out as an aluminum ball mount that looks great and is strong enough to work in the real world. Available in various drops, there is an Alumistinger that will work for you. Our Alumiball gives you a solution to rusty and greasy balls that may surprise you. All Rapid Hitches are offered with free shipping within the continental US.